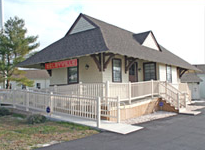 The Town of Selbyville’s small town atmosphere came alive recently with the addition of our new Railroad Museum. This Museum houses artifacts from the earliest town agricultural days to late 20th century items such as Police Department memorabilia. The Museum opened with a Grand Ribbon cutting June 18, 2005 celebrating the incorporation of our municipality in 1902.